On 9 March, in the Najwyższy Czas bi-weekly news magazine, the Dr. Rath Health Foundation published an analysis of the current political situation in Poland and Europe. Describing how democracy in Poland is being threatened by the dictatorial Brussels EU, the analysis was simultaneously published on social media and quickly reached people all around the country. Based on the reactions and comments it generated, the information contained in the analysis also has important implications for the people of the UK, who, on 23 June, are holding a referendum on whether their country should remain a member of the Brussels EU construct. The analysis notes that the so-called “Council of Europe” of the Brussels EU has recently been carrying out an investigation into whether it considers Poland to still be a democracy. Given that the Brussels EU is run by unelected bureaucrats, however, there is of course an exquisite irony in this. The so-called “European Commission”, the executive level of the Brussels EU, consists of 28 ‘commissars’ who, in assuming their roles, have never had their names appear on any electoral ballot sheet. Appointed by corporate interests at elite dinners with members of the secretive Bilderberg Group and suchlike, in no way can the governance of the Brussels EU be even remotely described as “democratic”. As for the so-called EU Parliament, this too is fundamentally undemocratic as it doesn’t have the right to initiate its own legislation – a basic hallmark of any true democracy. But there is a dark history behind the Brussels EU that millions of people in Poland, as well as millions more in the UK and throughout the rest of Europe, are still unaware of. 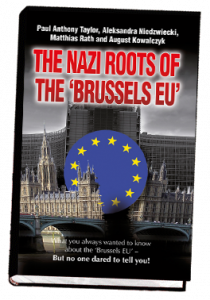 As we describe in our 2010 book, ‘The Nazi Roots of the Brussels EU’, the key architects of the Brussels EU construct were recruited from among the same technocrats who had previously designed the plans for a post-WWII Europe under the control of the Nazis and the IG Farben Cartel. Consisting of Bayer, BASF, Hoechst and other German pharmaceutical and chemical companies, IG Farben was a major funder of the German Nazi party and the driving force behind the perpetration of WWII. During the Nuremberg War Crimes Trial against its executives, held between 1947 and 1948, it was specifically stated that without IG Farben WWII would not have been possible. Following the trial, several IG Farben executives were sentenced for mass murder, slavery and other crimes against humanity. On 23 June citizens of the UK will be voting in a referendum on their country’s membership of the Brussels EU. The choice at stake for them concerns whether to submit to the increasing threats that are openly warning of “consequences” if they vote to leave, or whether to restore democracy and regain their country’s independence. Understanding this, the prime minister of Iceland, a country that is not a member of the Brussels EU, recently reminded the British people that they now have little or no say over decisions made by the dictatorial construct. 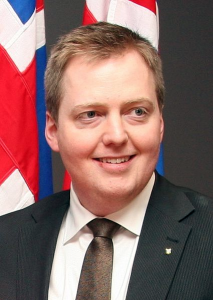 Describing the Brussels EU as being increasingly dominated by German interests, Icelandic prime minister Sigmundur Gunnlaugsson stated that leaders of other European countries are now simply called to meetings to approve what has already been decided in advance. In this situation, the implications for the British people are crystal clear. The heavy-handed interference in its affairs that the elected government of Poland is now experiencing is precisely what can also be expected in the UK, should its citizens choose to remain members of the Brussels EU. Ultimately, it can therefore be seen that the choice facing the UK on 23 June is a very clear one; namely, between democracy and outright dictatorship. In this respect, there can be little doubt that the outcome of the UK referendum, whatever it is, will ultimately affect the future of the British people for generations to come.